Experience the undeniable adrenaline rush of one of the world’s most exciting activities – Bungee Jumping! Raise money for Family Friends at no cost to yourself whilst taking to the skies and taking the leap of faith into the air after hearing the famous words, 3, 2, 1, Bungee! The incomparable and ultimate thrill of bungee jumping will have your heart racing as you fall towards the surface below only to experience the excitement of being pulled back towards the sky! 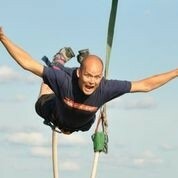 To book your charity bungee jump and support our work click here.